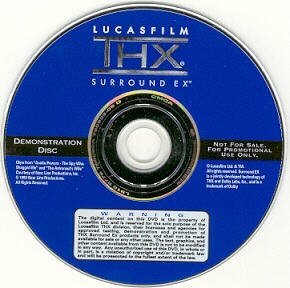 • THX Moo Can (0:30) DD 5.1 / DTS 5.1. • TEX 3 Action (0:40) DD 5.1 / DTS 5.1. • Cavalcade (0:27) DD 5.1 / DTS 5.1. • Ziegfeld (0:17) DD 5.1 / DTS 5.1. • Soulcalibur III (0:34) DD 5.1 / DTS 5.1. • Scarface (0:06) DD 5.1 / DTS 5.1. • Star Wars Episode III: Revenge Of The Sith (5:41) DD 5.1 / DTS 5.1. • Pirates Of The Caribbean: The Curse Of The Black Pearl (0:58)DD 5.1 / DTS 5.1. • X-Men (1:50) DD 5.1 / DTS 5.1. • Alien (1:04) DD 5.1 / DTS 5.1. • Die Hard (0:11)DD 5.1 / DTS 5.1. • Indiana Jones And The Raiders Of The Lost Ark - Golden Idol (3:26) DD 5.1 / DTS 5.1. • Indiana Jones And The Raiders Of The Lost Ark - Desert Chase (2:44) DD 5.1 / DTS 5.1. • Indiana Jones And The Last Crusade - Biplane Chase (4:19) DD 5.1 / DTS 5.1. • D Lucca - Cruise Control (5:04)DD 5.1 / DTS 5.1. • The Fry Street Quartet - Haydn's String Quartet In D Minor (2:45) DD 5.1 / DTS 5.1. • Joe McQueen & Friends - Poinciana (3:32) DD 5.1 / DTS 5.1. • Weber State University Students - Tchaikovsky's Capriccio Italien (3:21) DD 5.1 / DTS 5.1. • The Tom Finch Group - Sofia (6:49) DD 5.1 / DTS 5.1. • Weber State University Students - Traditional Cadence (1:04) DD 5.1 / DTS 5.1. • Mangaboy - Strobe (3:36) DD 5.1 / DTS 5.1. • Jean-Michael Jarre - Jarre In China - Aero (3:11) DD 5.1 / DTS 5.1. • Soulcalibur III (0:30) DD 5.1 / DTS 5.1. • Jak X: Combat Racing (0:35) DD 5.1 / DTS 5.1. • Home Theater Setup (11:11) DD 5.1 / DTS 5.1. • From The Studio To The Big Screen (3:37) DD 5.1 / DTS 5.1. • About THX Optimizer (0:36) DD 5.1 / DTS 5.1. Bitrate: DOLBY DIGITAL EX (448 kbps). Biojensen.dk sælger ikke demo disc. Det er kun en information side.